Our Parx Sportsbook review found this to be one of the most anticipated sports gambling launch for 2019. Besides SugarHouse, Rivers, and Hollywood Casinos, the sportsbook at Parx Casino is the fourth Philadelphia casino to open online sports betting. That said, PA sports betting should continue to grow. Thankfully, Parx Sportsbook is shaping up to be one of the best options around. Sign up today to be ready! Play today! What Parx Casino Sportsbook Promos are There? Is there a Parx Sportsbook App? To start, this Parx Sportsbook review will cover aspects related to how Parx Sportsbook operates. First, we review welcome offers from Parx Casino Sportsbook. Then, we explain what types of sports you can bet on at this Philadelphia casino. We’ll also look at some of the promos associated with Parx sports betting. Lastly, payment options, ease-of-use with Parx live stream, and expected promos for the opening of this Philadelphia Casino are covered. Like we said, this Parx Sportsbook review looks at some of the possible welcome bonuses expected to launch with the online Parx sports betting experience. As it stands, Parx Sportsbook only recently opened its doors to the public on January 10th. Interestingly, Parx Sportsbook has teamed up with Kambi to manage their PA sports betting, as well as to design their upcoming betting app. Now, welcome offers haven’t been released yet, but following what we’ve seen from Kambi in neighboring NJ, there is a good chance Parx Sportsbook will offer an introductory dollar-for-dollar match on initial bets up to a certain amount. Furthermore, Parx free picks could also be a part of introductory bonus offers. In fact, the Parx Casino Sportsbook website even has an informational page dedicated to explaining sports betting for newcomers. Again, since the Parx Sportsbook just opened its doors, there’s still not a lot of public information regarding promo offers. That said, the Parx live stream is certainly one benefit. Consequently, we believe that Parx free picks will also be an integral part of the welcome package. Moreover, since Parx Casino has a loyalty program, we think Parx Sportsbook online will implement a similar program. In brief, the casino loyalty program is called Xclub, based on a point system dependent on total accumulated wagers. With different tiers available, avid sports gamblers should find quality promos, including free plays, exclusive events, and other quality casino perks. Thus, once the Parx Sportsbook app is launched, there should be several online promos available. For the time being, the only way to bet with Parx Sportsbook is visiting Parx Casino or the South Philadelphia Turf Club. Now, when the app is launched later this year, geolocator technology will require you to be in-state in order to wager on sports events. However, if you plan to visit Parx for sports betting, you can use their Betslip Builder to plan your bets ahead of time. Fortunately, Parx is one of the top Philly casinos and offers perhaps the most elegant sports betting in PA. Furthermore, since Parx sports betting has teamed up with Kambi, an industry leader in online gambling and sports apps, the Parx sports betting app should operate seamlessly on both iOS and Android. Most likely, a desktop option will also be available. At the brick-and-mortar casino, the Parx Casino Sportsbook allows you to wager with cash, credit, or debit cards. Creating an account and depositing for the forthcoming online betting portal should also be seamless. In the past, Kambi has also offered different deposit and payment options including PayPal and prepaid cards. These should also be an option for future online gambling experiences offered by the Parx Sportsbook. Though Parx Casino Sportsbook just launched, one main advantage is that it builds off established brand recognition. Parx Casino is widely recognized as a market leader in the PA casino market. Likewise, their experienced leadership team and some members of their executive team have been involved with the UK sports betting market. Ideally, this should lead to excellent customer service. 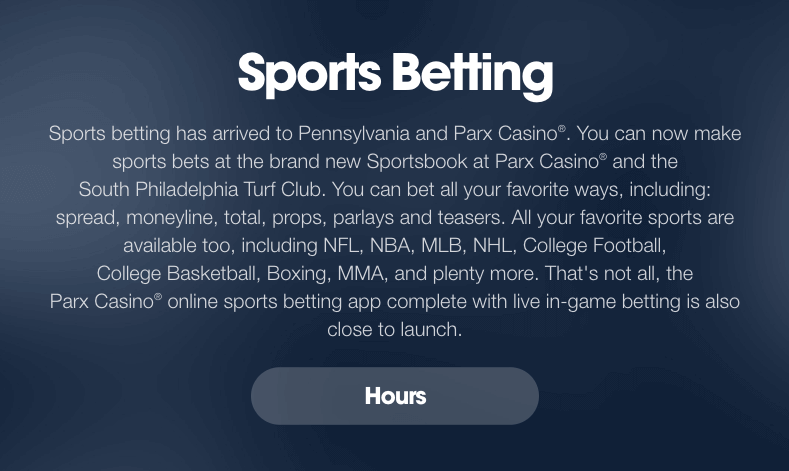 As this sportsbook is connected to a brick-and-mortar casino, Parx Casino Sportsbook will most likely offer an integrated platform that will allow gamblers to switch easily between the casino and sports betting. Most likely, the combination will also be part of the upcoming app. Finally, our Parx Sportsbook review concludes there should be several benefits that come with this PA sportsbook launch. Parx Philadelphia has long been an industry leader in the PA gaming industry and Parx Sportsbook online should continue this tradition. We think they’ll offer high-quality online sports betting in PA. Furthermore, the Parx sports betting experience offers a wide array of different games and wagering options, and the app and online betting website will only increase the opportunities for sports betting in the state of Pennsylvania. The only downside that we can think of is that the lack of competition in the PA sportsbook market could lead to relatively mild introductory bonuses and promos. In the meantime, check out your PA sports betting options!